Update 5:40 p.m. April 24, 2014, with details on the crimes allegedly committed, court appearances and what was confiscated in the raids. 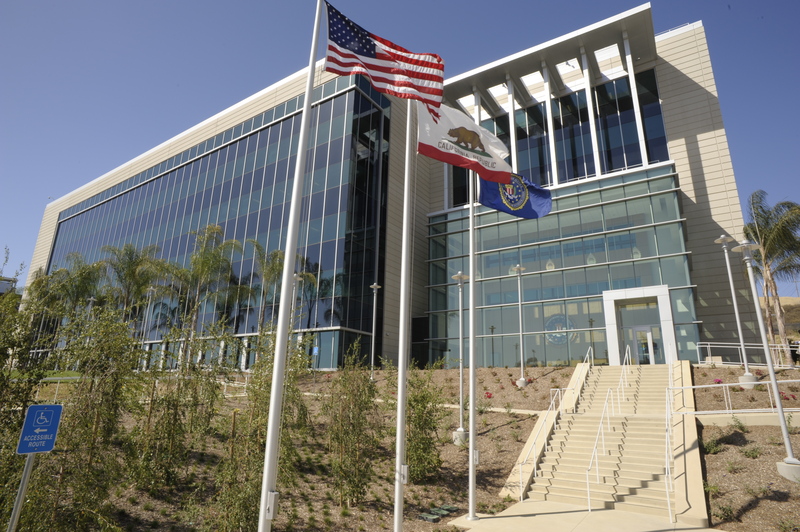 A drug investigation that started in El Cajon a year ago before evolving into a case involving multiple homicides and racketeering, has led to a major roundup of alleged gang members and associates around greater San Diego, authorities said. U.S. Attorney Laura Duffy said at a Thursday news conference that 45 people have been arrested at numerous locations throughout the region, and that law enforcement officers were still searching for nine other suspects. 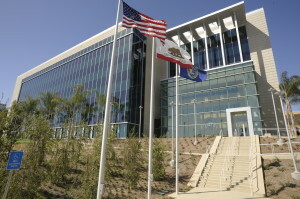 The FBI’s San Diego office in Sorrento Valley. Photo courtesy FBI. One of them, Randy Alton Graves, 50, of El Cajon, is considered the lead defendant in the case. The defendants – who apparently turned on other members, leading to several deadly shootings – took part in three conspiracies that overlapped, leading to racketeering charges under the RICO Act, Duffy said. “Today’s RICO charges can be viewed as nothing less than a virtual wrecking ball crashing into the ruthless, ultra-violent West Coast Crips, a gang that has been a scourge on San Diego communities for far too long,” Duffy said. She said the case will have a “significant” impact on public safety in areas dominated by the gang, such as El Cajon, Spring Valley and the San Diego neighborhoods of Logan Heights and East San Diego. One murder case linked to the defendants was of a member of the gang, Paris Hill, who talked to police about a homicide, she said. The 20-year-old man was found mortally wounded in Webster early last month. a pregnant woman who was a member of the gang was shot and wounded for challenging members about the two previous homicides. The first court appearances in the case will take place Friday and Monday. The prosecutions will be handled by both the U.S. Attorney’s Office and the San Diego District Attorney’s Office. Authorities said the El Cajon Police Department started a drug investigation last spring and detectives found links to various other cases throughout the region. Eventually, the Bureau of Alcohol, Tobacco and Firearms, FBI and San Diego Police Department got involved. Duffy said investigators intercepted tens of thousands of “disturbing” phone calls involving the suspects. Graves drives a baby blue Mercedes with paper plates, according to the U.S. Attorney’s Office. Anyone with information on Graves is asked to call the FBI at (858) 320-1800.